Orange Coast Fence has become one of the leading fence companies in Orange County because of the unbeatable value we provide. We design, construct, and repair durable, attractive, and long lasting fences and gates at highly competitive prices. 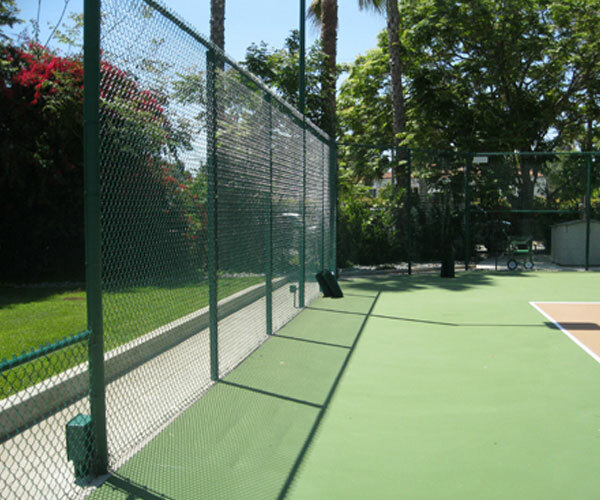 We have more than 30 years of experience serving the diverse fencing needs of commercial, industrial and residential clients throughout Irvine, Westminster, Costa Mesa, Huntington Beach, Santa Ana, and surrounding cities, and understand how to exceed customer expectations. 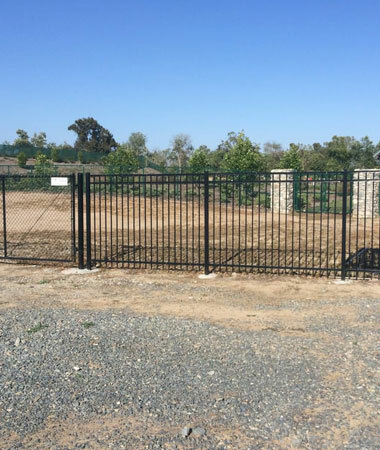 At Orange Coast Fence, we specialize in chain link, wood, and iron fence construction. Every fence we build meets the industry's highest standards for craftsmanship. By always starting with a thorough, on-site consultation, we're able to advise each customer on which type of fence would be ideal for their needs and budget. All consultations and estimates are conducted by our owner who has worked in the fence industry for nearly five decades. Because of this extensive experience, he is able to provide reliable guidance, educate clients on their best options, take accurate measurements, comply with any applicable codes, and ensure that every fence installation is done right the first time and within a timely manner. If you are looking for a qualified fence company to meet your fence installation, replacement, or repair needs in Lake Forest, Rancho Santa Margarita, Irvine, Westminster, Huntington Beach, Costa Mesa, or other city in Orange County, call Orange Coast Fence. We are licensed, fully insured, and highly reputable. For most fencing projects, we can provide ballpark estimates over the phone and a free onsite estimate. We're available Monday through Thursday, from 7am to 5pm, and accept cash, check, and all major credit cards. Our quotes are competitive, and we're always willing to help our clients find solutions if they have a specific budget or need in mind. All of our custom-installed fences and gates are backed by a one-year warranty. 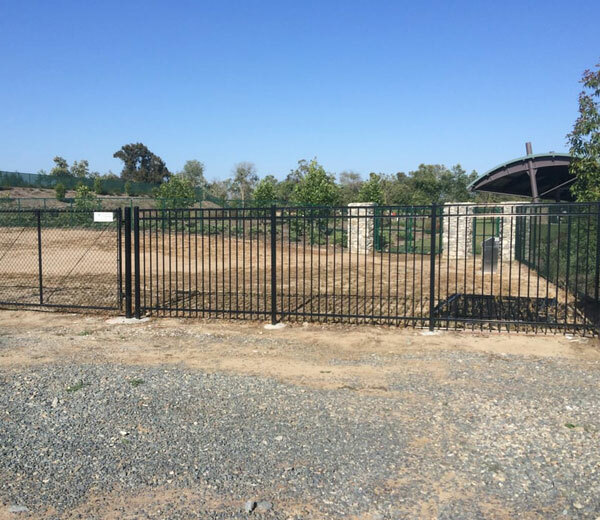 While Orange Coast Fence Co. offers Lake Forest, Rancho Santa Margarita, Irvine, Westminster, Huntington Beach, Costa Mesa, and surrounding areas a wide range of fencing solutions, our speciality is constructing chain link fences and gates. 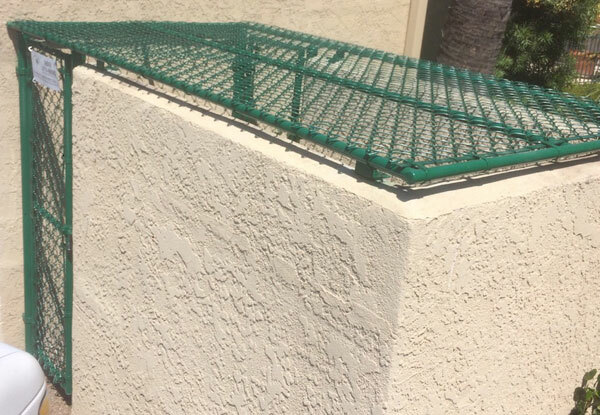 Our chain link fences are built with professional-grade, 9 or 11 gauge chain link and high-quality hardware. 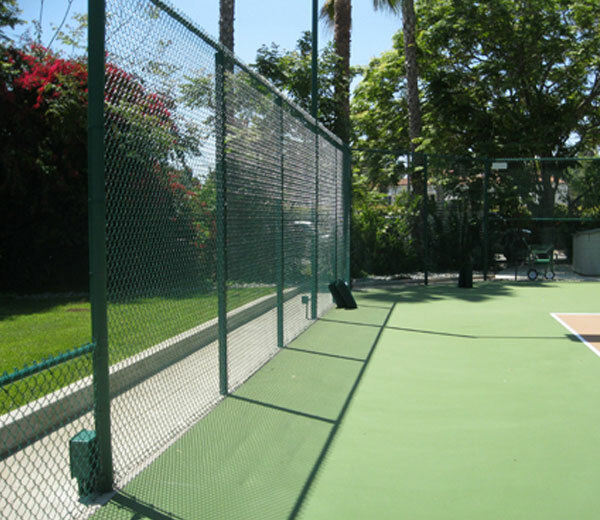 Clients can choose between galvanized chain link or vinyl-coated chain link in one of 5 colors: green, brown, beige, black, or white. Your chain link fence can be installed with or without privacy slats (available in beige, redwood, sky blue, rustic/brown, white, green, gray, and black), and topped with barbed wire or razor ribbon if security is a top priority. 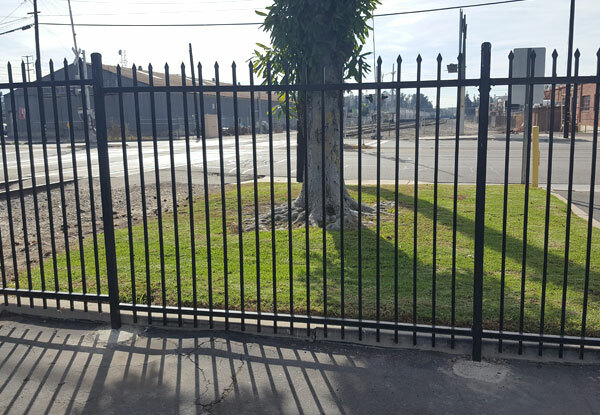 Whether you are looking for a simple chain link perimeter fence for your home or business, a security fence for an industrial yard, or a trash enclosure with a corrugated metal roof, Orange Coast Fence Co. will always deliver a quality fence at a great price. Orange Coast Fence Co. is Orange County's expert in iron fences and gates. Also known as tube steel or wrought iron fencing, iron fences are a great choice for property owners that need a sturdy and long-lasting fence that provides reliable security while creating or maintaining an elegant look. We offer three iron fence styles: regal, aristocrat, and guardian. These fences are made from pre-galvanized steel in a variety of sizes and thicknesses. For rust protection, this steel is given a powder coat finish, which is available in black or any custom color you would like. Our iron fences and gates are ideal for parking lots, buildings, pools, exterior yards, and property line fencing. We also can provide picket and rail replacement services at a cost-effective price if the existing iron fence or gate is still in relatively good condition but has a few damaged sections. Call us today for a free quote or on-site consultation on your iron fence project in Lake Forest, Rancho Santa Margarita, Irvine, Westminster, Costa Mesa, or other nearby area. 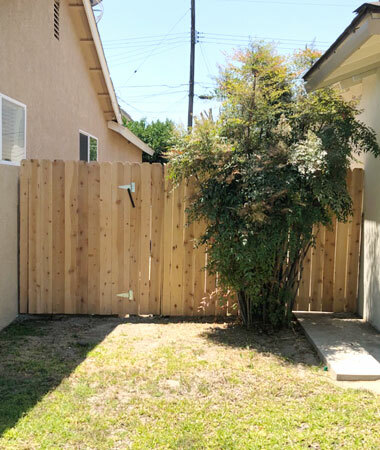 With Orange Coast Fence Co., you can get a beautiful, well-constructed wood fence and/or gate for your home or business in Orange County at a cost-effective price. We will build a wood fence according to your exact specifications or work with you to design a fence to meet a particular set of requirements. We can install picket fences, lodgepole/post and rail fences, and good neighbor fences, with either a cap and trim or dog-eared style design. For maximum durability and longevity, our wood fences are typically made of cedar boards, redwood rails, and redwood or stainless steel posts. By thoughtfully planning each job and following the industry’s best practices for construction, we look to not only meet each client's expectations, but exceed them. If there's an existing fence, we will tear it down and haul away the old wood. While we work, we will take care not to damage landscaping, and clean up after ourselves once we're done. Most wood fence and gate installations are completed within a day. 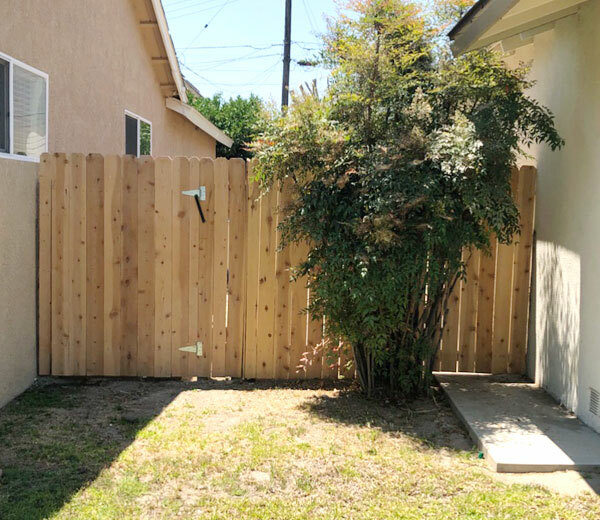 Call today if you are looking to install, replace, or repair a wood fence or gate in Lake Forest, Rancho Santa Margarita, Irvine, Westminster, Costa Mesa, Huntington Beach, or other nearby area. We completed this iron fence installation at a Westminster commercial property to provide extra security. It stands 6 feet tall and was constructed out of high grade, powder coated tube steel in our popular Aristocrat style. Why Businesses & Homeowners Throughout Orange County Choose Orange Coast Fence Co.